This Sunday saw the Grand Prix Trial take place for Warsaw. 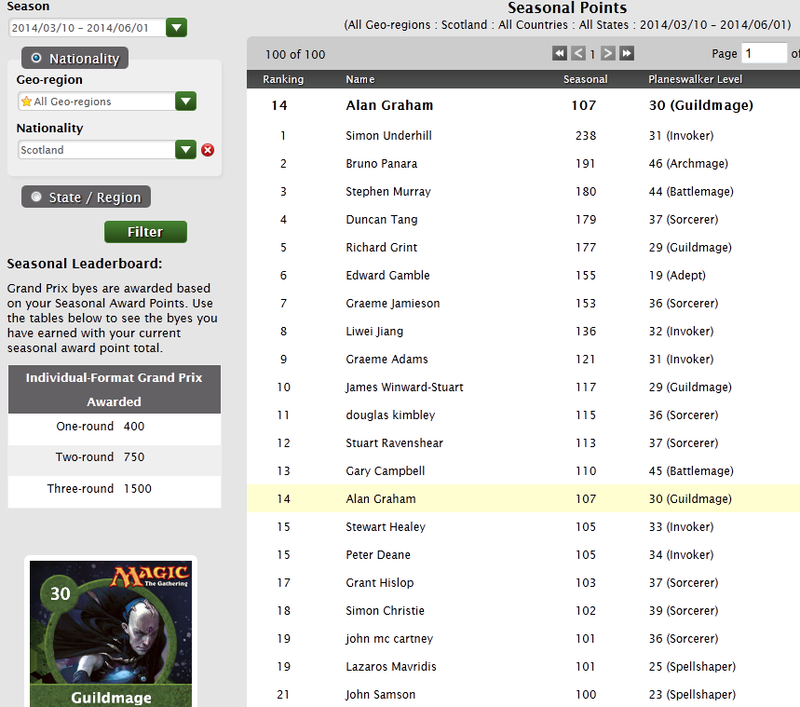 I was mostly interested in points to grind to try and get a bye for Grand Prix Manchester. At constructed on Thursday, my Mono Black Devotion deck was pretty poor. This was not helped by three of the four match ups being against Green which has recently been a bit tougher due to hexproof and the card advantage they get. I had a look round and switched to a Mono Black Devotion deck more able to compete against green, closer to one I ran at the start of Theros. On Sunday there were only 14 players so I knew 3-1 would get me into top 8, 2-2 might scrape in on tiebreakers but I was still hopeful to top 8. I had played Jamie before but couldn’t remember how the match up went. After mulling to 6 I got a T1 Thoughtseize taking a Supreme Verdict. He still had one and a Detention Sphere which I later stripped too. I managed to grind away winning game 1. For game two I sided in the 4 Duress and dropped a chunk of removal. We shuffle up and I feel pretty dirty. Turn 1 Duress removes a counter spell. 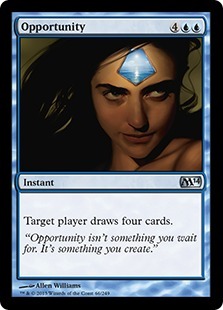 Turn 2 I topdeck a Thoughseize so use that and the other Duress in hand to remove an Elspeth and Verdict. His hand was all land and mine was an Underworld Connections, third land and 3 drop. It was pretty tense though and he wavered between 1-5 life for a few turns slowly removing things until I managed to win through. A thoughtseize made sure to leave him with a Doom Blade but there was nothing I could do about the number of threats he made. Neil made a number of good plays and decisions on what to play stopping me getting any 2for1s beating me 2-0. 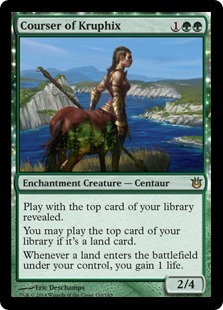 I guessed he would be playing green and was worried as it gets a lot of extra draw through Planeswalkers and Courser. My opening hand was 3 * Hero’s Downfall an Underworld Connections and 3 swamp so I was pretty confident I could stabilise. I did and managed to slowly eat away his board presence whilst dropping Demons etc. He scooped on 15 life when he had nothing on board, no hand and with me having 3 Mutavaults and 2 Demons on the field whilst being on 6 life. Game 2 went similar with a scoop on 15 life with no board. He just got flooded out both games. Winning this match would make me top 8, losing meant I relied on my tiebreakers which I assumed would be quite poor based on results I had heard from previous opponents. I think over 2 games I saw 3 Polukranos and 4 Courser of Kruphix. Game 1 at one point ended with me having no board, him with 1 of each of them and two planeswalkers. Welcome to scoopsville, population Alan. Ho-hum looks like it’s down to tiebreakers. Results are announced and someone had a durdle deck which resulted in a silly amount of draws pushing me into about 5th place. Bizarre. Hmm when the prize packs are put down for the loser I just move them to my side of the table and say we’ll get on with the formality of you wrecking me again then . Having lost every dice roll all day I was facing an opponent higher in the standings than me who had just smashed me. I somehow manage to curve out perfectly and get the right removal at the right time winning 2-0. A bit confused I move on to the semis. In some cruel jest I now face the other player who beat me in the Swiss. Game 1 I manage to strip his hand of removal and drop Demons on curve winning the race and forcing him to sac his board. Game 2 I rip out both his Hero’s Downfall and manage to beat down with a Demon and Nightveil Specter after he turn 4 Slaughter Games for Gary. Having won an FNM and been in the final of a couple this was my first proper tournament final. I catch the end of the other semi and see a mainly creature based deck. I keep a removal heavy hand and am punished for it, removal gets countered and a Master of Waves and Mutavault assault leaves me dead with him on 22 life. 1-0 down against a control deck. Baws. Game 2 I side in about 9 including the Duress and Bile Blight, Whip etc removing some creatures including some Pack Rats and Demons. I think Lifebane, Nightveil and Mutavault might be a better route. I make a horrible mistake early, dropping an Underworld Connections to bring Erebos live. This is to bait Colin into saccing his Ratchet Bomb on 3 so I can start dropping more Connections and a Demon. He does and I have to buy cards to 1 life to dig out of it. I get a Gary and swing up to 7. Buy again to 1 and then get up to 9. The incremental card advantage ekes me out a victory bringing it to 1-1. Game 3 and there’s fowk in the shop cheering for each of us. No pressure like. I play an Underworld Connections on Turn 3 which isn’t countered. Colin responds by naming Swamp. For this reason alone I run different temples. By turn 5 I have two Underworld Connections on board. He gradually gets rid of a lot of my creatures and uses Jace to take removal and counter spells. At one point I have the choice between a Syncopate and two Thoughtseize. I know he has a removal spell in hand so I let him get the two Thoughtseize. He takes two cards from me leaving himself with no black open. 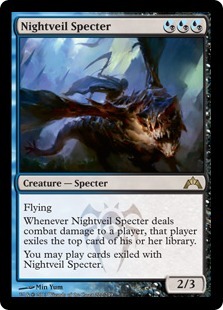 Next turn I swing with Nightveil Specter getting an Opportunity. That goes well with my two blue sources. I end up buying a lot of cards and end the game with 12 mana and two usable Underworld Connections to his 5 mana. There was not a lot he could do really in the circumstance, bad draws on his end and no extra mana from Jaces left him static for a while whilst I was drawing 3 cards per turn. I somehow managed to win the Grand Prix trial. I really felt I was punished for every mistake I made in this match up – getting two for one’d every chance he could. Pretty tough going. So should I want to go I get two Byes in Warsaw. Let’s hope I can do decently at the next few tourneys to earn a bye for Manchester 107 points down, 293 to go. This entry was posted on Monday, April 14th, 2014 at 2:19 pm	and is filed under Card Games. You can follow any comments to this entry through the RSS 2.0 feed. You can leave a comment, or trackback from your own site.